Several media outlets, including Reuters and Fox News, have declared lesbian Rep. Tammy Baldwin the winner of her Senate race Tuesday night. 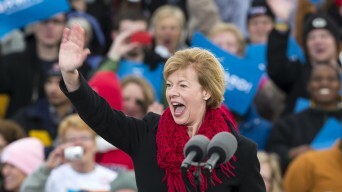 Early polls showed former Wisconsin Gov. Tommy Thompson with a slight lead over Baldwin shortly after Thompson won the GOP nomination in a primary in August. By the middle of September, polls showed Baldwin in the lead, but the size of her lead narrowed by late October, with some pollsters saying the two candidates were in a statistical tie going into Tuesday’s election. Baldwin’s quest to become the nation’s first openly gay U.S. senator captured the attention of the LGBT people across the country, many of whom contributed money to Baldwin’s campaign. Posted November 7th, 2012 & filed under Politics.